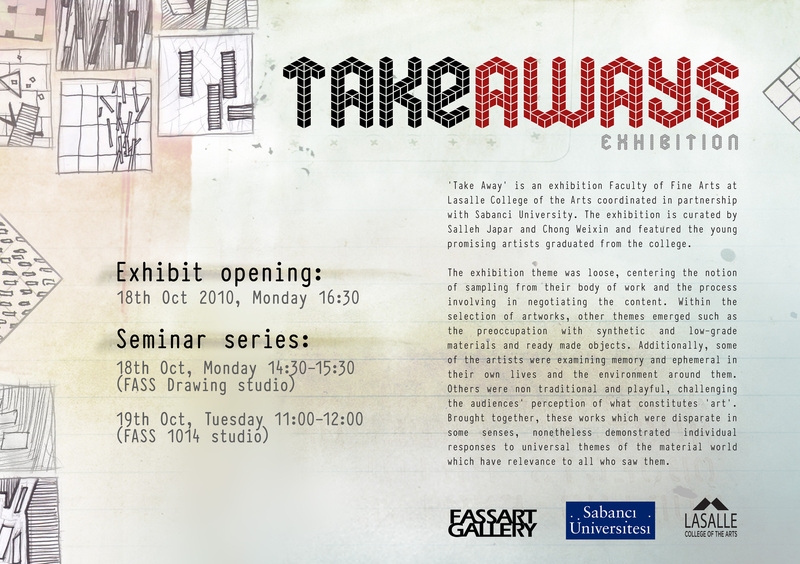 Takeaways is a selection of works from current students and recent graduates of LASALLE College of the Arts, Singapore. It is a glimpse at the artists as they address issues of their personal concern. At LASALLE, there is a vibrancy of environment as the artists come from Singapore’s traditional blend of cultures, as well as a variety of other countries both near and far. As students under the same academic discipline of art study in LASALLE, they explore artistic expression in light of contemporary and historical interpretations of art. 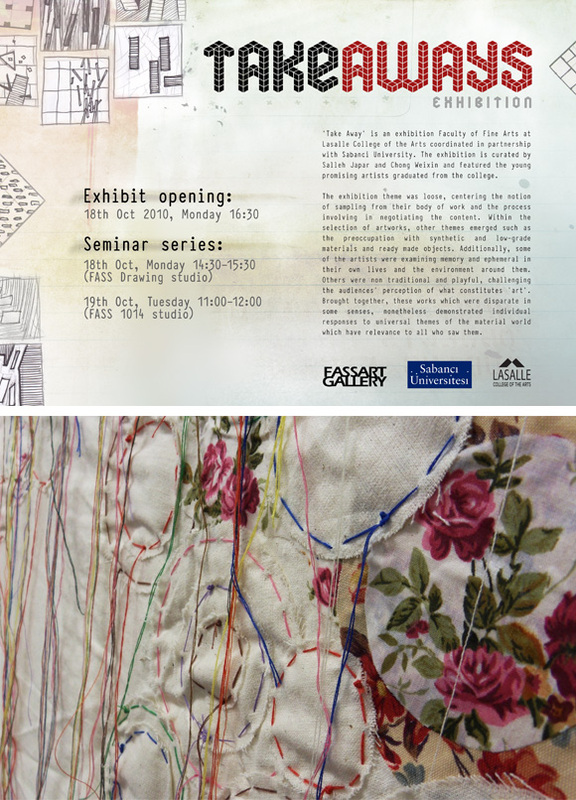 From painting to video installations, these works are articulated in a wide range of media. The artists’ concerns and approaches are diverse both in perspective and style; yet a shared purposefulness unites their individual expressions. Singapore as a nation has a history that spans decades instead of centuries. Its culture, like its constantly remodelled landscape, bears more marks of change than of the past. A context of efficiency, adaptability and mutual self-censorship underlies each form of industry- including the practice of artists and their works. This reflects a brand of multiculturalism typical of Singapore: unity based less on the adoption of individual languages, than on their rapid assimilation due to the flow of a very definite societal structure. It is an environment comparable to the many food centres available throughout Singapore, where one can take away from a diverse selection. From quintessential meals of the UK, Australia or New Zealand, to snack foods of South-east Asia, one regards a widely ‘multicultural’ selection that reflects both trend and personal tradition in its choices of efficiently packaged meals. With similar considerations of scale, transportability and variety, the show aims to present a sampling reflective of Singapore’s environment as well as the student body in LASALLE’s Faculty of Fine Arts. It is a take away; a parcel of exchange, and we hope, a memorable selection.